The restaurant was recently voted Best in Bristol by the Evening Post and offers a slightly more delicate and unusual selection of dishes. Myristica specialises in authentic, regional-specific Indian food and the menu goes far beyond what you’ll find on the highly Anglicised menus of normal curry houses. The menu reads like an Indian food odyssey with exotic ingredients and a much more extensive choice of fish and vegetarian dishes and desserts, and whereas most Indian restaurants use one curry sauce as a base for all their dishes, at Myristica all sauces are made individually to order for true authenticity. Sample dishes include starters of baby squid deep fried and tossed with bell peppers, chilli flakes and honey and rabbit varuval, a South Indian speciality of rabbit meat tossed with onions, chillies, curry leaves & ground spices; the house speciality main course of pista murgh (breast of chicken cooked in a mild cream sauce with ground pistachios and a hint of saffron) or prawn chettinad with kerala paratha (wild catch black tiger prawns cooked with a roasted blend of fennel, peppercorn and curry leaves ) and tandoori pineapple (glazed with cinnamon and honey served with saffron ice-cream) or chocolate samosas, for dessert. Despite losing the open plan kitchen feature at the new site, Amit is confident that Myristica will thrive on Welsh Back and it will be a great platform for growth of the business into a second site in Clifton in the near future. Myristica is expected to re-open mid March, please visit the website or call for bookings. 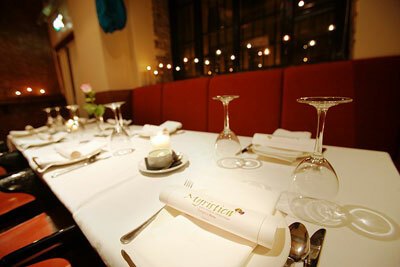 Myristica’s popular cookery school will re-commence on April 10. This entry was posted in Bristol, Restaurants and tagged Food, Indian, Myristica, Restaurants. Bookmark the permalink.